Abu Dhabi, UAE, 7th January 2019: The Al Shira’aa International Horse Show is proving a happy hunting ground for Syria’s Hicham Gharib, who on Monday evening claimed his second class in two days aboard the fleet-footed K.Abrax. The CSI1* show came to a close late on Monday evening and is the precursor to the CSI4* €250,000Al Shira’aa International Horse Show, which will begin on Wednesday and conclude on Saturday with the Longines Al Shira’aa Grand Prix. Monday’s first class attracted an enormous field of 74 starters and 36 riders went clear over the 110cm course. Denmark’s Tina Lund, who had landed both the third and fourth places in the previous class, was 13th to go and sailed into the lead with a smooth 28.44sec round. Next to go was 14-year-old UAE rider, Saif Awaida Mohammed Al Kirbi on Al Mazyouna came close to Lund’s time, with a 29.62sec mark. 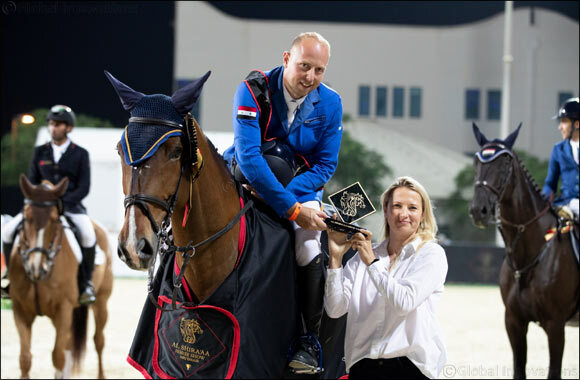 Lund’s lead stood until Mohammed Hassan Alhadi from the UAE and Jolie Van Essene D15 took to the arena and completed a fast clear in 28.19sec. But it was the combination of Gharib and K.Abrax that stormed through the jump off course in just 27.45sec to take the lead from Alhadi. The remaining twelve riders were unable to better the Gharib’s time leaving him to claim another victory in a show which has so far provided him with a two first places and one second. Gharib, who is based in Sharjah and campaigns two horses, K.Abrax and Elton on the UAE circuit said he was very happy with his performance. 'Unfortunately I won’t be competing at the CSI*4 event this time, as I competed last week and then today here at the Al Shira’aa International Horse Show CSI1* and then I have to rest my horse and make sure he is not over worked for next week for another competition. The late class on Sunday evening was claimed by the UAE’s Salim Ahmed Al Suwaidi on Snapp Jack who stopped the clock at 42.50sec after his clear round. Syrian, Hicham Gharib, winner of the earlier class, was once again in the money, coming second on Elton in a time of 43.20sec. Danish rider, Tina Lund proved to be in consistent form and captured both third and fourth places with Payse Heutiere and Beyond Fellow Dancing K in 43.68sec and 44.08sec respectively. The fences were set at 120cm and consisted of one round against the clock and there were 32 clear rounds out of a total of 54 starters.